In order to make sense of the shopping possibilities for German products, we have created a numbered list of the most common German specialties available in the U.S. Several shops that sell these items online are then printed below that, with the numbers 1 to 16 in parentheses, corresponding to the food they sell, along with their other unique offerings. Most Common German Specialties Available in the U.S.
Coffees: German coffee is strong and has a particular roast. We can now order Dallmayr, Tschibo, Eduscho and other brands roasted and ground in Germany to be delivered within the U.S.
Teas: Some specialty teas and loose tea are sold by these online companies. Packaged goods: Dry soup mixes, gravies, bouillon and other spice mixtures. Maggie is a liquid seasoning mix that many Germans use at the table (like soy sauce or Worcestershire sauce). Cookies: These tend to be less sweet than our counterparts and with a lot of hazelnuts. Bahlsen cookies are found in well-stocked groceries in the U.S., and Cost Plus/World Market and other import chains have a good selection, especially around Christmas time. Candy: These days, it is easier to find Haribo licorice, Milka, and liquor-filled chocolates, as well as marzipan in various forms. 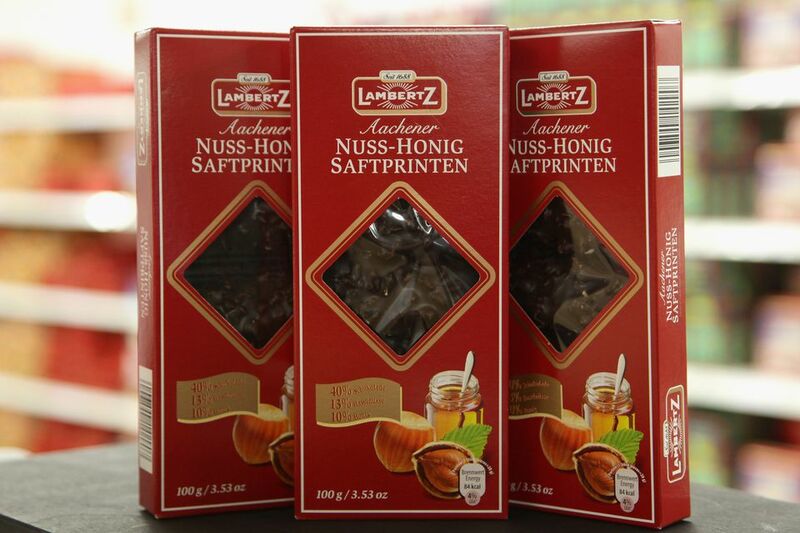 Christmas specialties: Nurnberger Lebkuchen, marzipan and Christmas chocolates flavored with coriander and cinnamon. Sauerkraut and pickles: My sister-in-law swears that the canned sauerkraut from Germany is much better than what you get here. Other people think so, too, since it is easy to find several different brands to buy. I find German pickles to be incomparable since I have not had an American pickle that tastes the same. Red Cabbage: Although you can make it yourself, red cabbage is also found in jars. This is one product you cannot find in the American grocery store. Fresh Sausage and liverwurst, etc. : the shipping costs will be high but to you, it may be worth it. Packaged meats: Some sausage and bacon can be shipped without refrigeration. Cheeses: Fresh cheeses and quark can be shipped from several sources. Tinned bread and cellophane-wrapped bread: Pumpernickel and Vollkornbrot are fairly easy to come by. Baking needs: Baking powders, whipping cream helper, cheesecake helper, Zitronat. Sometimes the real thing is just better. Specialty spices: Hot paprika, Potash, and Hirschhornsalz. Pasta and potato products: Dried Spätzle, dumplings, bread dumplings, potato pancake mix. Herbal bitters: Untermeyer, Mellisengeist, and others, which are good for the digestion. Bavaria Sausage, in Wisconsin (sells categories 1 to 15). Articles that may be unique to them: Palmin (shortening), fresh Pretzels and breakfast hard rolls to finish baking, curry ketchup, Lindt Weihnachtsschokolade with coriander and cinnamon. Globe Delicatessen based in Costa Mesa, Calif., with a brick-and-mortar store (sells 1 to 5, 12 to 16). They also sell Kindereier (Children's chocolate and milk eggs), various tinned herring, and sweet and hot Hungarian paprika. German Grocery in New York, N.Y. (sells 1 to 16). Special finds are Hanuta (hazelnut cookies, Mozartkugeln, Dominosteine (Christmas cookies), Rollmops (pickled herring). German Gourmet in Falls Church, Va., has a brick-and-mortar store (sells 1 to 15). Specialties include Chocolate Christmas Rings (to decorate the Christmas tree), sponge bottoms (for fruit tortes), and German magazines. Continental Sausage in Denver ships sausage, ham bacon, a variety of cheeses, breads, butters, quark and some dry goods. Schaller and Weber in New York sell sausages, smoked and cooked meats, pickles, and other condiments. German Deli in Texas sells meats, breads, cheeses, a variety of groceries, a good baking ingredient section, a household items section (mops, brooms, etc. ), and a holidays section. They do seem to be sold out of many of their items.